The Access Control Keypad is an attractive, rugged and reliable keypad for HAI's Omni family home control systems. The Access Control Keypad offers access to all options provided by HAI's home control systems. Select users of the keypad will be able to arm and disarm the security system (Omni family systems only), activate an electric door strike or magnetic locks, activate lighting, operate a garage door, open/close a security gate, set off a panic alarm and manage many other functions. The Access Control Keypad uses one of the serial ports on your HAI home control system. The number of keypads that you may use is limited by the number of available serial ports on your home control system. HAI Access Control Keypad is weatherproof and vandal resistant. The piezoelectric buttons work simply by tapping the surface, and do not require an actual physical movement. The sleek keys of this keypad can be operated with a bare finger or a snow-covered glove equally well. The keypad can be mounted anywhere outside of the home so that a contractor, pool or yard person could have their own individual code that allows access in hours and days (i.e. no access after 10pm, or while on vacation or in party mode, or on Sundays) that's restricted to a specific area of the home. For added security, use of this individual's code would trigger a video camera to record the user's entry or exit, and their comings and goings would be tracked in the controller's log. 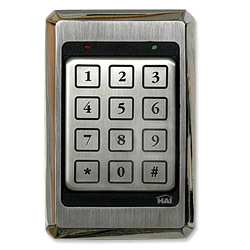 The keypad is encased in a stainless steel investment casting that will complement any décor. It mounts in a single gang switchbox or to the surface of any wall, indoors or outdoors. The red LED is illuminated when the security system is armed and the green LED is illuminated when it is disarmed providing simple reassurance for peace of mind.